CUSP is important for the Mornington Peninsula Regional Gallery because it provides a unique opportunity to present cutting edge design as part of the gallery program. Design is an important part of all our lives but the fact that many of the works being presented as part of Cusp have or are being developed with real life applications in mind is both timely and engaging. 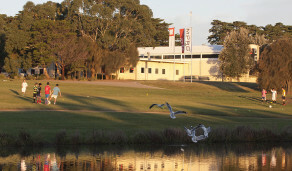 The scenic Mornington Peninsula is located an hour’s drive from Melbourne, and the Mornington Peninsula Regional Gallery is the area’s premier public art museum. The Gallery presents an ever-changing rotation of world-class exhibitions and events. In addition to presenting exhibitions, Mornington Peninsula Regional Gallery offers public programs, guided tours, workshops and illustrated lectures, as well as a range of resources for all visitors. Tuesday–Sunday, 10am–5pm. Open most public holidays. Closed Mondays. Visit the Mornington Peninsula Regional Gallery’s website.